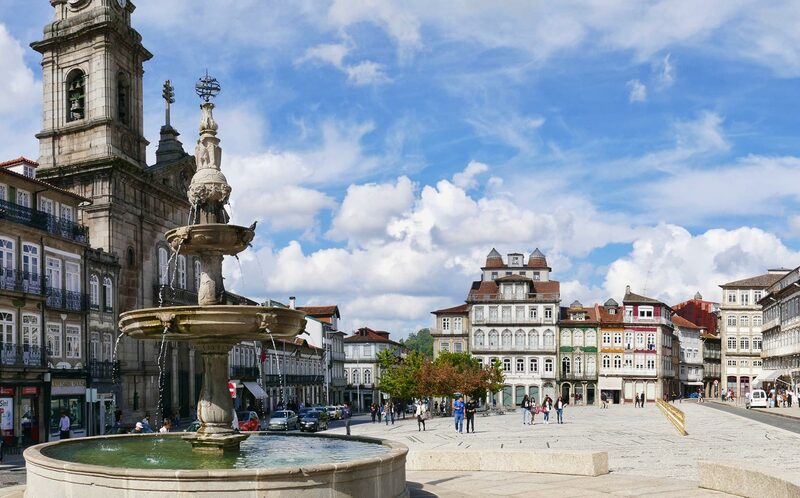 Heralded as the birthplace of Portugal as we know it today, the role of Guimarães in establishing Portugal’s status as an independent country and national identity is significant. Already housing an important monastery, protected from Moorish and Norman attack by a formidable castle and fortifications, in the 12th century Guimaraes also witnessed the birth of Portugal’s first king, Dom Afonso Henriques, who upon taking the throne proclaimed the town his capital. Through the efforts of the young king, Spain finally recognised Portugal, then Portucale, as a separate kingdom in 1143. Indeed the battlements and castle continue to represent the country as a whole in that they are outlined on the Portuguese coat of arms. The original monastery gave way to a lovely little Romanesque church, Igreja da Nossa Senhora da Oliveira, the remains of which house the font where Afonso Henriques was apparently baptised. However, the 10th century castle still stands strong with a dungeon measuring 27 metres in height and its eight square towers. Also worth visiting is the Alberto Sampaio Museum in the town centre, displaying many artefacts and vestments from the middle ages including a portable 14th century altar. An impressive bronze statue of Dom Afonso I, crafted in 1874 by Sores do Reis, can be found in the museum in the Paco Ducal. Gil Vicente also hailed from this busy northern town. A goldsmith by trade, he is credited with founding Portuguese theatre in the 16th century and has duly received the moniker ‘The Shakespeare of Portugal’. Long after Gil Vicente, goldsmithing has continued to be one of the many traditional crafts in the area alongside pottery and embroidery and, although Guimaraes embraces the modern world in many ways and is a commercially thriving small community, it is one of the special places in Portugal which has truly retained some of the ambiance of its medieval past, particularly notable in the Rua de Santa Maria and the Casa do Arco with its raised walkway.